Here’s how it happened. I was driving to work this morning, sitting at a stop light checking e-mails on my Blackberry. There it was…an e-mail saying my status has been updated at PeaceCorps.gov. I’m still about ten minutes from work, so I immediately log into the web site on my Blackberry as I’m driving to work. It’s slow, but it works. As I’m pulling into my parking space, the status page loads and there I learn my Medical screening is complete. It’s the news I’ve been waiting to hear since mid-November. Now just over five months since I received my nomination, I finally had made it through what everyone says is the toughest part. Finally!!!. Called Mom and Dad and both my sisters to share the news. I immediately looked at the calendar and started planning my next step. If I get the final word this week then I might be able to resign as soon as Monday. That would allow me to give three weeks notice and still have two full months before I depart. I wouldn’t have to burn any bridges by leaving during the May rating book, which I don’t plan to do any way. I even started writing my letter of resignation in my head. Greetings from the Placement Office at Peace Corps Headquarters in Washington, DC! We wanted to get in touch with you to congratulate you on receiving your medical clearance and therefore, for completing a very important part of the application process. Over the next few weeks, we will be conducting a final review of your application materials, and we will be in contact with you in the event that any additional information is needed. Once the application review is complete, we will update you on the next steps of the application process. Corps events; talking to Returned Volunteers; and reading books, articles, and other resources about Peace Corps. You can also find resources and learning activities on our website and in My Toolkit. date, please let me know. Thank you for your interest in Peace Corps, and please feel free to e-mail me if you have any questions at this point. Otherwise, we look forward to contacting you in a short few weeks! It’s clearly a form letter, but certainly not what I was expecting. I sincerely hope I don’t have to wait two to three more weeks to find out. The letter also makes it pretty clear that my invitation is not a “done deal”. It is also clearly targeted to students. I still plan to call my recruiter tomorrow to find out what she can tell me. And to complicate matters, tomorrow morning I have my first conversation with my new boss. We’re just chatting on the phone in advance of her arrival and clearly I can’t tell her that I don’t plan to be working here much longer, because there is always the chance I might. Tonight, I got home to catch up on my regular blog reading and found several people who are leaving for FIJI on the 23rd of MAY. I'm guessing that means I won't be going there since I don't leave until June. I'm probably spending way too much time trying to figure out where I will be sent, but I am enjoying it. I'm learning a lot about what it is like to be in the Peace Corps and realize that many others have the same thoughts and concerns that I have. Here's a quote that I found tonight on Matt's Peace Corps Adventure. Man, just when u thought it was gonna get easier i totally read over all my paperwork for my invitation to FIJI.... The red tape and essays and resumees never end..~!!!! !I need to now file a new updated resumee for my in country officers to check out, and answer a 5 part essay about what i am plan on getting out of this experience, ect ect... Guess i had better get used to it huh.. Its not that hard, just one more thing on my plate.. :)For anyone thinking of getting into the Peace Corps, just know, that you will never be done filling out paperwork, filling out forms, getting medically probed and prodded and writing ssays or statements!!!! He seems to have the same feelings I have had recently. The good news is that while my doctor doesn't work on Thursday, the nurse was there and she wrote new orders to have my blood work done. The lab told me the results should be back tomorrow afternoon so hopefully I will really be done with my medical application. Of course, I have to get the results from my doctor and not from the lab, so that could delay matters. There are just six countries in the Pacific Islands with Active Peace Corps programs. There is always a chance that my program could be a start-up. Here are actual departure dates I've found on various blogs. So what does this mean? I'm guessing that the larger programs have more than one departure date each year. The June departure for Vanuatu could be my program. If you remember, I originally thought I was going to Vanuatu but then saw the September date. The Vanuatu program is the largest according to the PC web site with 88 current volunteers. If that is the case, it is possible they do two programs a year. And the training for the June group would be done by mid-September so that could work. My best guess is now Vanuatu...and they list a business development program. The Peace Corps also has its own Vanuatu Web Site. And on that site, Only in Vanuatu is a must-read. So what's my best guess? Vanuatu. Hopefully I'll soon know if I'm right. 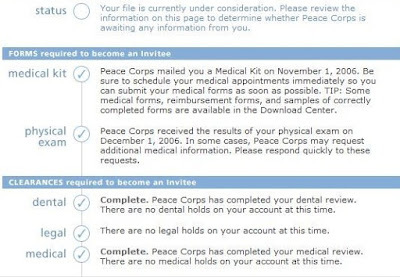 I thought today I would be finished with my medical application to the Peace Corps. That didn’t happen. Last Friday I had all of my blood work done. I gave the nurse at my doctor’s office the e-mail I received from the medical officer detailing the additional tests that needed to be done. My doctor ordered the tests from that e-mail. When I got to the lab, I showed the e-mail to the lab technician, who consulted a reference book and assured me that the tests on the e-mail were being done. Unfortunately one of the tests performed was not correct. We asked that you please provide a copy of the results of your Hepatitis B surface antigen, Hepatitis B core antibody, Hepatitis C serology & G6PD titers. These tests are required for all applicants. There are a variety of tests that can be performed for Hepatitis B. Insist that these required tests are obtained. There are no substitutes. The result of a Hepatitis B surface antibody test was submitted that was not requested or required, it does not substitute for the result of your Hepatitis B core antibody. Please provide a copy of the result of your Hepatitis B core antibody test as required. This means, I’ve got to do it all over again…at least the lab work. I believe my doctor’s office is closed on Thursday, but I’m going to go there in the morning and try and get this done again. If that fails, I’ll try to find another doctor to issue the order, then I’ll get the lab work done. It will take a few days once it is done to get the results, which means probably Tuesday or Wednesday of next week. Unfortunately, the lab orders are written in "code" so it is very tough to see exactly what you are getting. At least now I can say I need the “CORE” antibody. I have no idea what that means, and I don’t actually really care. My doctor says I don’t have Hepatitis, not that I had any reason to think I did, and I suspect that won’t change with this latest test. I can’t really fault the Peace Corps for this one. Actually, I was pretty impressed that I got the response less than an hour after sending them everything. Of course, I also don’t know if this is some obscure test or if both my doctor and the lab just messed up. If all else fails, I do have a doctors appointment on Monday and I’ll get the new blood work order done then. I just hate to keep waiting. I have a new boss who is starting in just over two weeks. I would hate to have to resign on her first day on the job. That will fuel lots of speculation that she was the reason I left…and I haven’t even met her yet. As we say in TV, “Stay Tuned”! I was pleasantly surprised to get a phone call today from my recruiter, Tricia. She said she had called the head person in the medical office and asked him to review my file. He did that and then sent me the following e-mail. I have finished a review of your application that you submitted using an outdated form rather than the current form provided with your medical kit. We unfortunately therefore do not have a complete application. Please provide a copy of the results of your Hepatitis B surface antigen, Hepatitis B core antibody, Hepatitis C serology & G6PD titers. These tests are required for all applicants. There are a variety of tests that can be performed for Hepatitis B. Insist that these required tests are obtained. There are no substitutes. We require that you provide us with documentation of past or current Td - Tetanus/diphtheria (submitted with your application and current), OPV/IPV - Polio and MMR - Measles, Mumps & Rubella immunizations. Please obtain copies of this information for your personal safekeeping and review of correctness and completeness before personally faxing copies to 202-692-1561. This invariably prevents unnecessary delays in receiving the required information. If this is all that is required, I feel GREAT about my application. I sent him an e-mail tonight telling him that I have made a doctors appointment for March 26th to have the shots and bloodwork done. I also asked him to confirm that this was the only outstanding issue with my application. I may try to see if I can find someone else to give me the shots sooner and order the lab work. I'm assuming that once that is done, I should be good to go. If I can't get this done sooner, then I probably won't be able to send the paperwork to them until March 28th...that's two weeks away. Oh in case you were wondering about the reference to the outdated form...I had to download the forms from the Internet because it took a month for the paperwork to arrive and I had already set up all my medical appointments. Tricia told me the delay was because they were changing the form. That sounds like the government!! My other good news...my company paid out the year-end bonuses today. If I had resigned before getting that, I would have lost the bonus as that is our policy. It's been exactly two weeks since my last conversation with anyone at the Peace Corps. That meant it was time today for my bi-weekly round of phones calls. I got voice mail when I called both my recruiter, Tricia and the Medical officer, Dennis. Tricia was the first to call back saying that, NO, she didn't have any news but that she really thinks I should hear something soon. She said if I didn't hear back from the medical office, to let her know and she would follow up personally. A while later, Dennis called back and left a voice mail that no one has looked at my file yet and repeated what he said two weeks ago, that they were backed up but that someone should be looking at it soon. This time, neither Tricia or Dennis said to call back in two weeks but both told me to stay in contact with them. Tricia says she checks my file every couple of days because there should be some action soon. Even though I don't know anything yet, I did give my dog to Mom and Dad on Monday since they probably will not be back in Florida until after I leave. It's pretty lonely without "Lady". And somehow it makes leaving seem a bit more real. I know they will take good care of her while I'm away and she'll probably get more attention than I could have given her. It's not permanent. If I don't get into the Peace Corps for some reason, Lady will be back here very quickly. It was nice to spend time with Mom and Dad. 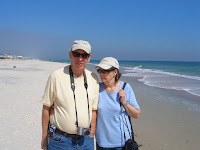 We were at St. George Island in North Florida for the past few days. I also got a chance to see a couple of friends of mine from Tallahassee who drove down for a visit on Sunday. I told them of my plans to join the Peace Corps. I think my friend Tim didn't believe me at first but was very supportive once he realized I was serious. I suspect I will get that reaction from others as I expand the list of people who know of my plans. I don't intent to tell anyone else until I know something more concrete, however, it is increasingly difficult to not know exactly what will be happening. Today I had a conversation with someone at work about something that could happen in November and another about our plans for Hurricane Season. It was tough to have that conversation knowing that if the Peace Corps accepts me, I will be a long way away from West Palm Beach this November and that the only hurricanes I'll be worrying about will be in the South Pacific. There is no question that the Peace Corps is a federal government bureaucracy. And yes, I have read all the information about how getting medical clearance is the most frustrating part of the application process. I'm beginning to understand. Today, I called my recruiter, Tricia, to inquire about my status. She had asked me to call if I had not heard anything about my application by today. She looked in her computer and it still shows that I'm awaiting medical clearance. She said I should call the Medical Officer who was in charge of my application...a guy named Dennis in DC. I immediately called and he answered the phone. Very friendly guy but the bottom line is that they haven't even looked at my medical application yet. He said they are jammed up, more than normal, and they were having trouble getting caught up. He said once they look at my file, it will happen very fast. They will either call or send me a letter if they need more information, or just approve it. As we were chatting, he mentioned that he and his wife had been in a similar situation with a house and jobs when they decided to volunteer. He told me to be patient and if I haven't heard something in two weeks, to give him a call back. I'm beginning to think that may be the standard line--call back in two weeks. He did give me a little nugget of information. He said that while the official rule is that all invitations are given six weeks before departure, that it really is more like eight weeks. He said I would probably not be leaving until mid-June, perhaps around the 15th or so for my program. That's about eight weeks from the April 21st deadline that I was given two weeks ago. That is actually really good news. If I don't actually hear until April 21st, that would still give me time to give adequate notice at work and still have a few weeks to get ready to leave. It would limit my ability to do any substantial trips before I depart but I can make that work. I don't know if my assumptions about the departures being the same every year are correct, but there does seem to be some consistency in the dates. So what now? I wait two more weeks. And I keep reminding myself that patience is a virtue.